I love to celebrate—the holidays, birthday parties, weddings—any opportunity to celebrate is a good one in my book. However, all good things have to come to an end and knowing when that end has arrived tends to be a bit fuzzy for some people. For example, holiday décor. The holidays are one of the most magical, festive times of year when we celebrate with friends & families, nestled in our homes with beautiful touches that reflect the holiday festivities and the season. Just like a great Broadway play, eventually the curtain has to fall and the holidays are over. With a musical I love it when the melody lingers on; with the holidays I don’t love it when décor lingers. 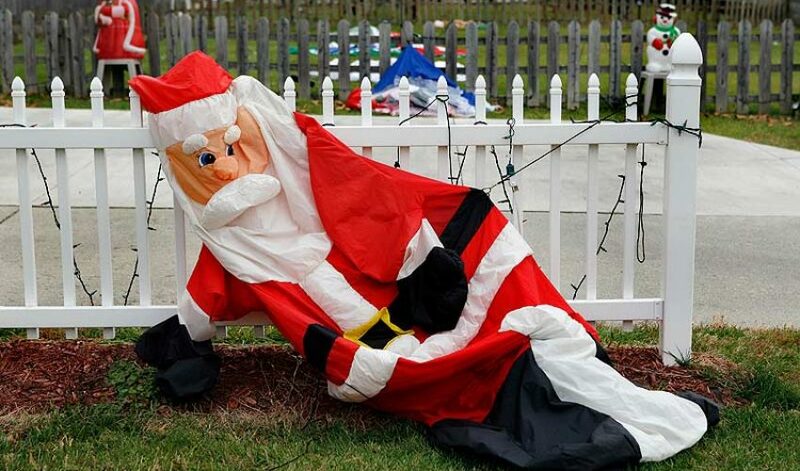 Let’s hang on to the sentiments, not the santas on the lawn. Now don’t get me wrong, I believe in enjoying the decor for as long as possible, and I believe the end of January gives us ample time to begin the migration back into the storage boxes. But come February—and as I write this it’s February 2nd—I drive throughout Connecticut and New York and I’m puzzled by the deflated Santa Clauses on the front lawn, the tired & dried out holiday wreaths, the swags of garland—which once had such a lush texture and color—drooping and fading away calling for you to put them out of their misery. It’s over people! We didn’t even have mountains of snow as an excuse for why we can’t get to those decorations! So no matter where you live, if you see holiday decor remember this simple blog and let’s share a giggle together, as I’m often stumped as to just how long someone can keep their holiday decor up. My philosophy is quite simple: take the time and energy to enjoy the décor while you embrace the celebration. And just as you put time and effort into putting it up, schedule that same time (and enjoy the less effort) to take it down. In the end, it is more meaningful to have the decor up for the appropriate time then to have it outlast the season. And say so-long to Santa. After all, soon we’ll be able to say hello to almost-Spring!